The city of Boston is staging its annual marathon. Kathrine Switzer became the first woman to officially run the race 45 years ago, despite stewards trying to physically force the 20-year-old off the road. Here she recalls how a female runner caused such a fuss. Anything long like 800m, or even longer, God forbid, was considered dangerous, de-sexing and de-feminising for a woman. [It was thought] that their uterus might fall out and their legs would get big, and maybe they would grow hair on their chests. Running made me feel free and powerful. It was what I wanted to do, so I did it. I asked my coach, Arnie Briggs: "Do you think I'll be welcome at Boston? Maybe it's against the rules." We got out the rule book, but there was nothing about women being forbidden in the marathon. It was just assumed that no woman in her right mind would want to run a marathon and they wouldn't be capable anyway. So Arnie said: "Fill out the form". We were milling around together doing our warm up exercises, so all the guys saw that I was a woman. But obviously the officials didn't. I was nervous and anticipatory going into the race, but I was confident I could do the distance because I had just done a 31 mile (50km) run [in training]. But like any marathoner, you worry about things you can't control - like the weather or getting blisters. The gun went off and down the street we went. At the start of a marathon you are so relieved. You have done all these months of training, it's like going to Mecca. At last, you're the pilgrim, you're making your voyage, so I felt wonderful. Two miles (3km) into the race, a truck came along packed with timers, scorers and officials. Behind that was the press truck which was loaded with photographers - and they went crazy seeing a woman in the race! Then all of sudden I heard a scraping noise of shoes running faster than mine. I turned around and I saw the angriest face I had ever seen. It was a race official, Jock Semple. He grabbed me by the shoulders, spun me back, and screamed: "Get the hell out of my race". He started trying to rip off my bib numbers. With that Arnie jumped in and said: "Leave her alone. She's OK, I've trained her. You stay out of this." He [Jock Semple] came back and grabbed me again. He had me by the sweatshirt and I was trying to get away from him. He was pulling me back when all of sudden, my boyfriend, Tom Miller, came running full tilt and hit this race official with the most beautiful cross-body block you could ever imagine, and sent him flying through the air. Arnie's eyes got huge. He said: "Run like hell," and down the street we went. I was crying, I was so terrified that my boyfriend had hit this official. I was embarrassed and really, really scared. I realised at that moment that everything had changed. Suddenly it became a contest of proving that women could do it. The official was trying to throw me out of the race simply because I was a woman. He didn't believe I was serious or that I was entitled to be there. He had shamed me so much in front of the whole world. And then that turned to anger and I was so determined that nothing was going to stop me. I thought: "I deserve to be here. If I can do the distance then why not? It's a public road." [But] I was very afraid because this official had got up off the pavement, got back on the bus, and about half a mile later cursed at us loudly again. By that point all the guys were on my side, so you can imagine what they said to him. I just thought he was a man out of control, but he was also a man of his time. In 1967 women were not supposed to be going out in public and doing these kinds of things. I grew up during the race. I started the Boston Marathon as a young girl, and came out the other end a grown woman. About 20 miles (32km) into the race, I came to the conclusion that when I finished, I was going to try to be a better athlete and try to create opportunities for women so they would experience the same sense of power, strength and freedom that I had. When I crossed the finish line, it wasn't like "Wow! I did it - I did my first marathon". It was like "Wow! I've got a life plan!" 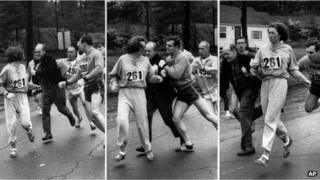 Kathrine Switzer was interviewed on the BBC World Service programme, Sporting Witness. You can download a podcast of the programme or browse the archive.